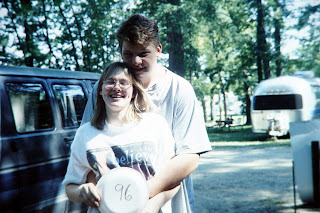 I started this blog the day Sara and I found out we were going to be parents. Now, she and Miranda are waiting for me on the other side. These are my thoughts, letters, and the memories I'll keep until we meet again. It was 16 years ago today...Friday, October 27, 1995. We went to the Homecoming dinner. I remember waiting for you in the lounge, so nervous, almost giddy. You came down from your room wearing a beautiful little black dress. The night went by so fast, and yet so slowly. I remember going to the after dinner party in downtown Jackson. We watched a movie...sort of. We went for a carriage ride through the city streets...and talked about us. We'd been spending a lot of time together...friends were buzzing about whether or not we were "a thing." We walked around the downtown area for a while after the carriage ride. I asked you if you liked the thought of "us." You said, "yes." Your eyes sparkled so beautifully, you were so modest and shy. We held hands, walking close together, our joy fighting the late October chill. We drove back to Spring Arbor and hung out in the lounge a little while longer, but not too late. I remember it was getting close to midnight and we were both getting tired. You walked outside with me, as I was walking to my car...we stopped as we got to the end of the dorm...we said good night...and I kissed you...and you kissed me. Our first kiss. It's the only first kiss I remember so vividly. I floated home that night...alive with joy and excitement. I miss your kisses. So soft, delicate, passionate, so full of life. I love you. I miss you. Give Miranda a kiss from daddy. I recently saw a friend of mine, who's husband passed away in March of this year. She brought him into our conversation several times, and it was so refreshing to hear about him. I really felt like she was sharing him with me, and it was an honor. Just like I feel in this post, thank you for sharing your precious moments with your wife with us. Sending much prayers of comfort your way. I just spent the last hour reading through your story. I don't want to sadden you now with my grief, for I've been crying the entire hour, I just want to tell you that you are being prayed for. That someone out in Utah is thinking about you and your wife and your daughter at this moment, and someone is praying for you and supporting you. You have given me hope. All I know of you is the postings here, and yet it is enough to show me that you are a strong person and a good person. Your daughter is beautiful. Your wife is beautiful and your marriage is a testament of love. Thank you for your courage. Thank you for reading my blog. Comments must be approved before they are posted. I try to approve comments several times throughout the day. Don't do things to other people you don't want them to do to you. The postings on this blog are mine. I wrote them for me, and have allowed you (and the rest of the world) to read them as you liked. Feel free to share them, if you wish, but give credit where credit is due if you quote me. I've tried to always acknowledge the authors of the quotes I've posted in the blog and appreciate your doing the same if you quote me. Sad and Chara - copyright Chad Cole 2011. Ethereal theme. Powered by Blogger.